As I got into the office, the ambiance is normal. It's just like any other day except that we got to wear causal clothing. Never expected that something exciting will happen for this day (except for the dinner treat of Rod in Crocodile). A good 15 minutes, there's a buzz from one of our colleagues that there are Kapamilya stars in the building and they are shooting some scenes in the 5th floor for a Star Cinema movie (our office is in the 7th floor). Most of their peronal stuff, PAs and some Star Cinema staff are in the 8th floor and a portion there was made into their "standby area. All of us got excited especially when we learned that John Lloyd will be in the movie and he will shoot some scenes today. 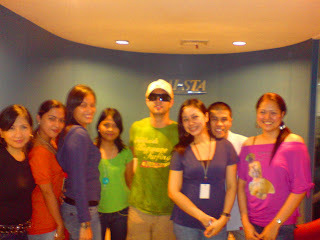 Then we asked our guard to give us notice once a celebrity will passed by our office....hehehe. After a 15 minutes, Joross came and he was waiting for the elevator. 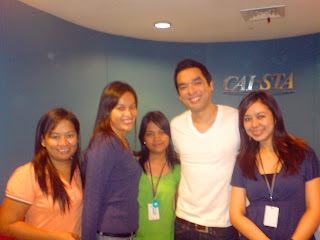 Just like Bernard, we have our picture taken with him...hahaha! Too bad his wearing sunglasses when this photo was taken but let me tell you, he smells so good. We're all wondering what perfume his wearing. Then the secretary to our company's VP went up to the 8th floor and asked a few people there. She called one of the staff in our admin and asked permission if we could offer our training room as a "standy area" for some of the stars. Don't ask me why she did that. Even I don't know why she offered it but we were glad that she did. 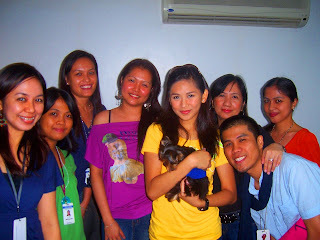 A couple of hours later, Sarah Geronimo came with her parents and her pet doggie. Then after like 30 minutes, Gio Alvarez cam and then Joross Gamboa. One of my officemate asked Sarah's mom if we could have our picture taken with their daughter and she readily said yes (they are so humble and nice people). 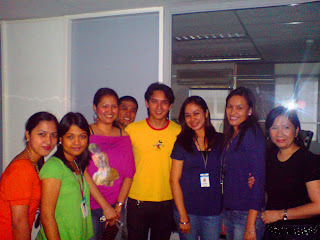 Lastly is Gio Alvarez whom my gay buddy courageously asked if it's okay to take his picture with us. He wnt to the training room by himself, all of us unaware. After finishing this blog entry, we didn't see any signs of John Lloyd. They said that his in the building (5th floor). Too bad we didn't see him. Probably, he stayed on the 5th floor and never bothered to leave or maybe he already went home. Tough luck!